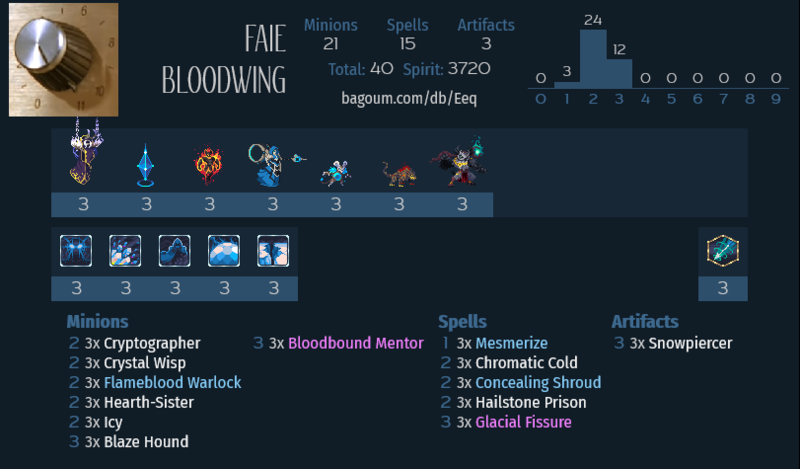 Aggro Faie has always been a staple deck archetype, inherently on the strength of her Bloodbound spell. However, it's popularity dwindled in the face of robust mid-range decks that have the tools to handle the pressures of Aggro decks. While many aggro decks tend to put opt for cards geared towards mid game, this deck is intentionally a two-pump chump designed to put the fear in your opponents and go for broke every game. [Updated January 27, 2019] After some tinkering around for a bit, I realized that the Wailing Overdrive and Protosensor on paper seemed to make sense (as well as being laying it on thick with the theme), but it rarely lines up where you want to use it. I’ve swapped out these cards for Icy and Cystal Wisp. I’m still on the fence about the inclusion of Crystal Wisp over say Primus Fist but I noticed that the extra mana ramp if you can get it early game can progress your game plan significantly and to a point act as a bluff on an opening turn. So right off the hop – this is by no means a competitive or viable deck. Experienced players will immediately sniff out your intentions as your opening turn options will leave little doubt what they are up against. Somebody is going to die by 7 mana if you choose to use this deck – and likely it will be you. From this list, you can see your standard fare of aggro oriented options as well as ways to deal with defensive plays from your opponent and continually stick on your opponents. Because there are no cards over 3 mana in this deck, the discipline you need to have is when it makes ‘sense’ to pile into your opponent and hit them with the shock and awe. That being said, the singular focus of this deck is to present the threat of big damage every turn and no respect for your own health pool. If you find yourself in the doldrums of a ladder climb, this deck can be a one off to catch an opponent off guard with the rote game plan. Ideally, you want to hit Cystal Wisp for your opening turn, regardless of being Player 1 or Player 2 and should be attempting to mulligan for it. You should generally avoid opening with a Flameblood Warlock as it does tend to reveal what deck you’re playing and should be saved to finish a game, or lay it on thick when you have a high damage turn. Blaze Hound is a nice backup, especially as Player 2 as it gives you a full hand, can make effective trades, or in the rare case a decent face option against the general. Icy‘s value as a card comes from it’s ability to stun minions or generals. As a way to control a threat for a turn, the card is fantastic for that reason alone, but the true value is from keeping the opponent’s General in place. There may be times where you have an enemy general on the center tile on four mana, but it doesn’t make sense to dump a Glacier Fissure. You can hold them in place and line them up for the next turn – even if they don’t play their next minion in the center tile on the turn they are stunned, you might be able to Hearth Sister or Mesmerize a minon on the center tile and then Glacier Fissure for the clear and the pain. You can also consider stunning a General on the adjacent columns if you have a Mesmerize + Glacier Fissure in hand for your next turn. The inclusion of Crystal Wisp over Primus Fist is debateable and I’d encourage you to go with what you think will suit you best. Given that the minions in this deck don’t tend to stick very well, Primus Fist won’t be as effective as you’d hope. On the other hand, having 5 Mana is where you have a breadth of card combinations and if you manage the early ramp with Crystal Wisp you can have your opponent reeling early on. Something that has been oddly consistent is how rarely I will use this on it’s first activation (Player 1 – 4 Mana // Player 2 – 5 Mana) as they are better power/set-up plays to had. This is not necessarily a bad thing because of your potential with dropping Bloodbound Mentor on your next turn and obtaining a free Bloodbound spell and then having the next activation immediately on the next turn. You will have to judge at times whether you want to go for that potential and possibly have to ‘waste’ a BBS activation but more often than not you will get the pay off. If it isn’t clear by now, your main scheme is to bring the enemy general to the center tile so you can hit them with a Glacier Fissure. Now sure, this can be played around rather easily by an opponent but your opponents sometimes can just not resist being in range because **spoiler alert** positioning is still key to their game plan. Positioning your General and minions in a way that entices your opponent to the center of the board is crucial. As I touch on in the next section, most games of Duelyst result in the opposing generals being near or on the center of the board at one point or the other. This deck embraces that quirk and seeks to exploit it. Glacial Fissure has always been an enigma of a card to me. On one hand, the screams of ‘MEME!’ jump from this card given it’s limited functionality, but high damage potential. On the other, this card can be incredibly effective in early game because of how positioning for the opposing generals play out on the few first turns. What I really appreciate about Glacial Fissure is what kind of a gut-check it represents to your opponent. It can leave them trying to awkwardly position themselves to avoid the potential of being hit by it and hamper their ability to carry out their game plan. This combo can be potent if you are Player 2 given it’s 4 mana cost. Player 1 will usually find themselves either on the center tile or the right-most column on their starting side by their second turn. On top of this, many times they placed a minon on their first turn to ramp into one of the mana tiles on the center column for their second turn. If you have a Glacial Fissure + Mesmerize in hand, you are potentially getting a minion clear and 8 to the face. On their own, Glacial Fissure becomes a marginal card where as Mesmerize does allow some flex for positioning. Whether it’s a cheap way to line up a Bloodbound spell or move a body block to get in an opponents face, it does not need to be exclusively held to find a Glacial Fissure. This is the standard fare of any Aggro Faie Deck – in the context of this deck you will likely find it being used to close out the game as you pepper them with your Bloodbound spell if they are trying to retreat defensively. Do not be afraid to slam Bloodbound Mentor in the face of your opponent as it’s usually unlikely you’re going to get more than one proc from him in conjunction with your Bloodbound spell. It is a legitimate threat on the board and your opponent will likely try to deal with it even if positioned defensively. If they use their face to clear it, even better! Truly one of the most annoying spells is the game is without a doubt Shroud. Full immunity to incoming damage, this combination is usually the set up to close out a game. If you have your crowd control options in hand to follow up on the next turn, (Hailstone Prison, Mesmerize, Hearth Sister, Chromatic Cold), you can continue to stick to your opponent which at a minimum represents 10 damage (40% of their health!). Even if your opponent dispels you, a lot of minions in early/mid-game do not have more than 5 health so if your opponent doesn’t have the pings/direct spell damage to deal with it, you’ll likely be clearing those minions on the opponents turn as they are going to instinctively be defensive in this situation. To reiterate, this deck is not meant to be serious. It barely qualifies as a meme deck as it doesn’t have any clever use of game mechanics and it’s tunnel vision on damage can have you stall out with defensive plays from an opponent. But what would Duelyst be without Lightning Fast Tactical Combat™? Show the Galaxy Brains on ladder that their machinations and carefully thought out plans can be toppled by brute force and battle shouts.